The Dalhousie Student Union (DSU) is now fully independent in its advocacy efforts after DSU council voted to leave provincial student advocacy group Students Nova Scotia (SNS) at a special council meeting on Friday. Before the vote occurred, DSU President Ramz Aziz gave a presentation on his experiences with SNS and his vision for the future of DSU advocacy. He estimated the DSU will reclaim approximately $45,000 if they disaffiliate from SNS. During the question period for his speech, Aziz alleged the organization has a culture of racism, and that racist comments were frequently made and then “laughed off” by members of SNS. Jonathan Williams, executive director, was present for the beginning of the meeting. Williams left after he was not allowed to give a speech he had prepared. Daniel Smith, architecture and planning rep on council, had voted to add a speech by Williams to the agenda. Council voted this down, preventing Williams from speaking, though DSU Vice President (Internal) Jacqueline Skiptunis noted she had met with SNS the preceding Friday and emailed them the prior week asking if there was anything they wanted to pass on to councillors. SNS has not yet publicly responded to the DSU’s statement alleging evidence of systemic sexism, discrimination and unprofessional behaviour in their organization. “I just think that it’s good to hear from both sides, and I think that Ramz will have a good view of the DSU’s participation in that, and it will be very beneficial to see both sides of that, to have both presentations and then a question and answer after that,” said Smith when motioning to add a speech by Williams to the meeting’s agenda. Some councilors gave their reasons for being against Williams’ speech. “I’m really concerned, as SNS has proven in the past to make irrelevant personal attacks at different members of the DSU, that it’s not actually a safe idea to have them present. I’d be concerned about the environment that would create,” said Alexandra Killham, Women’s Community Representative on council. “Likewise, I’d like to speak against adding this to the agenda, as much as I’d like to have more information for this conversation, Students Nova Scotia does have a history of both telling lies at council meetings and also using true information as –” said Aaron Beale, Member-at-large on council, before Jomel Varghese, Sexton Campus Director, called a point of order. “I think that point just convinces councillors of voting against, by saying Students Nova Scotia is lying to councillors, or things like that,” said Varghese. “You know, if this presentation had come to us weeks ago, we could fact check everything and continue this conversation. We’re not able to do that,” said Beale. Beale did not cite any specific cases where SNS has lied to council. “[…] I think there should be a chance given to SNS as well to speak to council, just so that we can hear both sides, because I consider this is a really being vote, especially when the motion is on the floor to leave the SNS organization. So it would be really in the best interest of the council to have an idea of what is there and what is not there,” said Varghese. Varghese continued to say it was brought to his attention that SNS had approached to present at council last year, but was not allowed to present. Dylan Letendre, Senate Representative, said that when SNS presented to council in fall, he wasn’t satisfied with their answers to his questions. Black Students’ Representative, Michael Davies-Cole, said he didn’t see the relevance in the presentation. Jonathan Williams was given speaking rights to make a quick point. Six councillors voted in favour of hearing the speech, 13 voted against, and four abstained. After the vote to keep him from presenting, Williams emailed the text of his prepared speech to the Gazette. In William’s speech, which may be found here, he says he showed up alone at the meeting “because our volunteers and our staff members did not sign up to be suffer personal attacks or have their work misrepresented”. “To be honest, knowing what had happened at this council last year, one of our representatives, who happens to be a woman, actually had a panic attack that prevented them from assisting me in our presentation to council in the fall,” says Williams in the speech. The speech contains a summary of projects SNS has pursued in the last year. It expands on a vision paper that was released to council the previous week outlining SNS’ stance that student financial assistance should be prioritized over tuition reductions. The speech also includes a list of SNS projects that the DSU allegedly opted not to participate in over the last two years. Prior to debate surrounding the vote, Aziz gave a presentation explaining his involvement with SNS, why he believed the DSU should leave SNS, and his vision for the future of advocacy in the DSU. He said Wednesday’s general meeting informed the last section of the his presentation, regarding upcoming advocacy for the union. “Recommendations for what we should do, and moving forward, what we want advocacy to look like. I added that section after I heard that come up at Wednesday’s GM, they were like ‘Well what are we going to do afterwards?’ Valid point, so I try to address that,” said Aziz. Aziz said that at the start of the year, he took on the position of Vice President Administration with SNS and hoped for the DSU to take on a leadership role within the organization. He said he learned that “drastic changes to the organization were not possible”, like having the reduction of tuition fees be a major goal for the year. He noted that the time he spent working for SNS was time he was not spending on campus, and spoke further to his concerns with the way the organization is run. “You will find Students Nova Scotia’s campaign budget is actually smaller than the Dal budget, and something like that bothers me,” said Aziz. He noted that a DSU unaffiliated to any external groups can still collaborate with student unions affiliated with SNS and the Canadian Federation of Students. He said the DSU’s upcoming governance review can review the allocation of the $45,000 that the DSU would retain if they left SNS. “Initial thoughts are, we can invest in one more staff person that’s focused on campaigns, or specific research areas for it,” said Aziz. After Aziz’s presentation Yazan Khader, Member-at-large on council, asked how SNS addresses oppression of women and minorities. Five of the six student associations remaining affiliated with SNS have graduate programs: Acadia University, Cape Breton University, Saint Mary’s University, St. Francis Xavier University and the Atlantic School of Theology. He also said he voted “yes” to remaining a member of SNS when he was Vice President (Internal) on DSU council last year and this question was brought up, explaining the reasons why he voted this way. “Last year, I was here as VPI, and I voted to stay with Students Nova Scotia. I acted in good faith, again, I was new to the game, so I thought this was an organization that could still have something to offer to the union. I felt it was something that could be useful to Dalhousie students, especially at the provincial advocacy stage. We had just dropped out of CASA, so I was like ‘Ok, if we drop out of Students Nova Scotia too, maybe that’s too much shock to the system, maybe that’s too much change, maybe we won’t be in a position to do our own advocacy.’ So that’s why I voted yes,” he said. But the video of the Feb. 26, 2014 meeting of DSU council where this vote occurred shows Aziz voting to disaffiliate from SNS. Aziz told the Gazette he was referring to a vote made at the March 12, 2014 meeting of council where a motion was presented to rejoin SNS after the DSU had left the organization in February. Additionally, the question Aziz returned to in the speech referred to a “$90,000” investment by the DSU in SNS, but the 2014-15 SNS budget says the DSU actually pays $92,266. At the end of the discussion that ensued following the end of Aziz’s presentation, Jacqueline Skiptunis, DSU Vice President (Academic and External), spoke against claims that SNS hadn’t been invited to speak at the meeting with copies of email chains. The second chain of emails Skiptunis brought copies of regarded a meeting she had with SNS on Feb. 20. Skiptunis motioned to go in camera before continuing with her information. 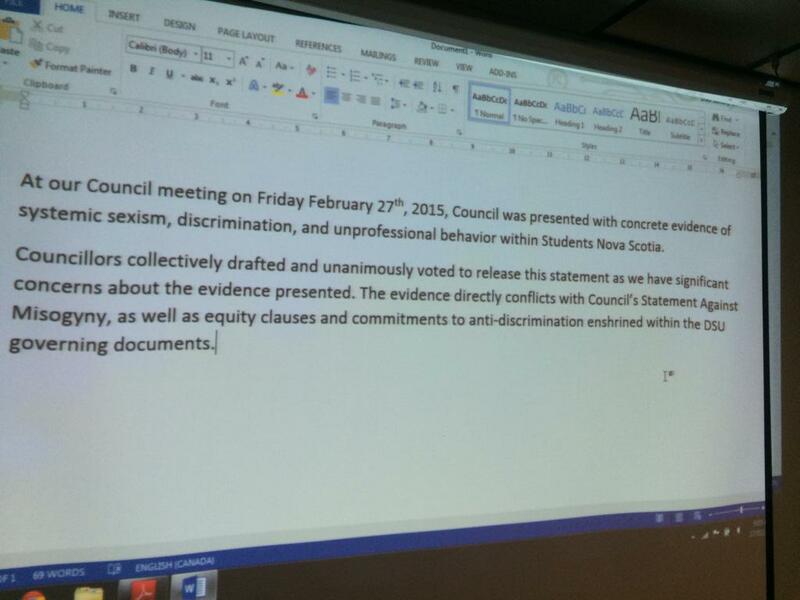 “At our Council meeting on Friday February 27th, 2015, Council was presented with concrete evidence of systemic sexism, discrimination, and unprofessional behavior within Students Nova Scotia. Skiptunis has told the Gazette the evidence cited in the statement is composed of minutes of meetings of the SNS board and personal emails. She has indicated the evidence cited in this statement may possibly be released to the public, but the DSU would first have to consult its lawyer and general manager. Shortly after this statement’s release, the vote was held. The motion to leave SNS saw twenty-five votes in favour of leaving, three abstentions and one vote to remain affiliated with SNS. Two of the councillors who abstained said the material presented during the in camera session changed their initial vote. SNS has not yet publicly commented on the DSU’s statement alleging evidence of systemic sexism, discrimination and unprofessional behaviour in their organization. On Feb. 27, SNS released a letter from a woman in their organization choosing to remain anonymous in response to a letter sent to members of DSU council by the South House Sexual and Gender Resource Centre on Feb. 25. The letter signed by the board and staff of South House outlines the organization’s reasons for suggesting the DSU disaffiliate from SNS. The letter alleges structural sexism in SNS and says SNS “has never displayed more than a shallow understanding of sexism and oppression,” with specific incidents that led to this stance being outlined. SNS’ letter in response names prominent feminists who have worked with SNS and explains projects SNS has pursued specifically related to the status of women. The DSU doesn’t advertise their positions well, Gazette has covered extensively on this (great journalism by the way, must be nice the DSU is giving you so much material). So my thinking is why are they looking to take money back and do advocacy “themselves” when the students in these positions will graduate and move on? What do they have to gain? Do they really think this is in the student interest? Well, considering positions aren’t advertised and may likely given to “insiders”, this is really concerning. Are they being transparent about the claims made in-camera (not even clear why in-camera was necessary? Are they really calling staff members of SNS (some of whom are students by the way) racist and sexist? Are they running a referendum on membership to see what the students they represent think? NOPE. This isn’t even acceptable and any Dalhousie student should be up in arms. SNS provides continuity of advocacy, that’s the service they provide. If the DSU thinks they can get all these fluffy specialized reports in specialized areas, run impactful campaigns, develop relationships with senior members of government, create a platform for student engagement , build a media network, etc. with $45,000, or even $90,000, they are delusional.